There isn’t anything out there in the world of digital music reproduction that beats the sound of a real instrument. Nevertheless, the piano is one of those instruments that composers, performers and audio engineers have sought to emulate over the years. With ultra-powerful computers with higher sample rates and more memory, it has become a viable alternative for many of us to incorporate (albeit representations of) high-class and immaculately recorded pianos in our work. With the exception of one company (more about this later), it has become the norm for manufacturers to produce mammoth size sample libraries with ever-increasing finesse, to feed our constantly growing quest for the perfect piano. Amongst the many pianos being sampled, the main ones still seem to be Steinway, Bösendorfer, Yamaha, Bechstein and Blüthner. Perhaps this is because of their sheer presence and reputation. These are all very different beasts, preferred by musicians the world over for their individuality and performance. In addition, many lesser known pianos have been recorded, including a host of uprights and modified pianos. The main heavyweights in this category are EastWest pianos, Synthogy Ivory and Vienna Imperial. Others in this group are Best service, Steinberg, Sampletekk/PMI, Native instruments and Art Vista all of which deliver varying degrees of control, quality and make of instruments being sampled. Most digital pianos can sound anywhere from good to great hidden in a mix. It’s when they’re played in a solo environment that issues arise. Because of the shortcomings of Midi technology, available computer RAM and disk space, sound designers needed to employ such techniques as looping, single notes stretched across a range of notes, OR single velocity key-strikes, creating a limited amount of control which results in unrealistic piano performances. Manufacturers have attempted to address this issue over the years, by increasing the amount of samples recorded over many dynamic layers, adding release tails and other characteristics such as Sustain and Una Corda pedal samples, mechanical key noises and string resonance modelling. Looking at the current crop of virtual pianos their overall quality is pretty impressive. Each of the following libraries has its own charactaristics and feel. 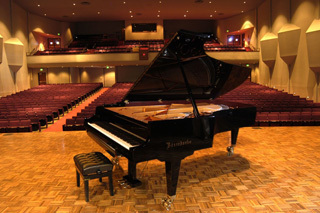 Three pianos make up the basic Synthogy library, Steinway Model D, Bösendorfer 290 and a Yamaha C7. A further Italian Grand (there is no mention of what this is — Fazioli perhaps?) is sold separately as is a new library of upright pianos. 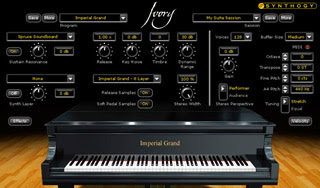 A multi platform plug-in, Ivory has an easy to navigate user interface with its own DSP engine of effects and ambience. Separate Sustain and Una Corda pedal samples add a level of reality, as do the Sympathetic String-Resonance modelling and Mechanical Key Noise. A host of custom controls affecting Stereo Width and Perspective, Timbre Control, Stretch and Equal Tempered Tuning all contribute to one very versatile and malleable instrument. To conserve on horsepower, there is the option of switching off the release portion of the sound and the soft pedal samples. Ivory employs up to 12 dynamic levels for each of its pianos. Smaller keysets are available for use in a busy arrangement where the piano requires less of a critical ear. For those Vangelis sounding sequences, the synth pad is a welcome addition. Overall Ivory really holds its own when played solo. Playing the Bösendorfer with the largest keyset in place and some effect to go, you can almost forget there is a computer driving it, except for the constant ticks of the hard drive reading so many samples simultaneously. This is by far the largest piano sample set to date. Employing over 68,000 samples across 4 pianos, 18 dynamic layers and 3 microphone placements, EW pianos will take you the best part of a day to install before you can hear the advantage that the company claims over its rivals. All the pianos were recorded at EastWest’s LA studios 1 and 2 and employ a convolution reverb whose impulses include the large orchestral hall used to record EastWest’s Orchestral libraries. Applying this reverb to the pianos thus ensures compatibility with the reverberant samples of that library. A microphone mixer allows you to blend and pan the selection of close, player perspective and room mics. The staccato samples feature is not found on other libraries. Played at 180bpm these are very short notes accessed via the mod wheel and this creates a very realistic sounding fast repetition when compared to the usual sustained notes played in staccato style. Other playing articulations include the Una Corda making the sound a softer and more intimate. By emulating the shifting of the piano action they hit only two strings instead of three. ‘Sustain pedal on’ kicks in when the sustain pedal is depressed and deploys a whole other set of samples. All patches have alternative ‘lite’ versions, sampled at minor thirds. There is an option for switching out the multiple mics and copious samples are used for the different articulations if your system is having trouble swallowing all that data. The pianos themselves all complement each other in terms of variety of sound. The Bechstein D280, known for its big brash sound and sharp attack at higher volumes, contrasts with the much less aggressive darker sound of the Bösendorfer. As with the real world counterpart and its typical voicing, this piano needs a slightly heavier touch to bring out its highs. 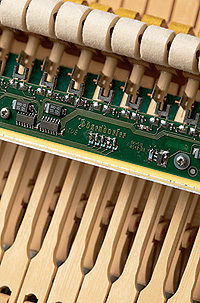 A defining characteristic of the Bösendorfer 290 is the additional keys at the lower end, sometimes painted black, which add a distinct resonant texture when the sustain pedal is pressed. Yamaha pianos have a reputation for being bright sounding, cutting through any mix alongside other amplified instruments in pop/rock genres. The C7 recorded here doesn’t sound overly harsh but is definitely the brightest of the four. To my ear, the Steinway rules. Possessing a very open and clear sound, its ability to straddle any genre and sound even, whether in a small recording studio or a concert hall, is remarkable. And the one sampled here holds its own in every way. With the advent of 64-bit computer technology, seemingly unlimited space and RAM, sound companies are sampling instruments with unprecedented detail. 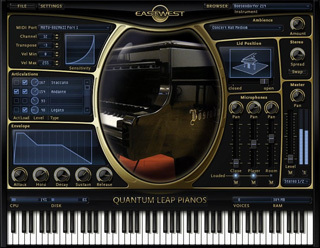 Both Synthogy and EastWest have been sampling their pianos at higher and higher dynamic levels, reaching an extraordinary 18 levels. VSL issued their first piano, a Bösendorfer 290 in 2006, and have now issued a new version of the same piano, called the Bösendorfer Imperial, sampled at 100 dynamic levels per note! Whether or not this is needed might be debatable but it has definitely added an extreme technical improvement over the efforts of other companies. VSL has done this with some help from the piano makers and an innovative technique they have developed called the CEUS recording apparatus. The system uses optical sensors, microprocessors and electromagnetic controls to track the replicate hammer and pedal movements. This enables performances to be recorded and played back with great accuracy. As a result, it’s impossible to hear any trace of dynamic ‘stepping’ in Vienna Imperial: dynamic transitions are 100 percent smooth for the entire dynamic range. Another barrier to perfect piano sampling bites the dust! True to its real counterpart, the Vienna Imperial sounds rich and stately, with a fantastically big bottom and steely highs. Its trademark attack, which can cut through a big orchestra playing at full steam, sounds lyrical and warm played on its own. This is due in part to the piano’s particular voicing and to the enormously intensive dynamic sampling. The recording was done at VSL’s own silent stage recording studio with the 290 on loan from the piano firm, which happens conveniently to be in the same city. The release samples are timed and graded to match note lengths, retaining authentic decays. Repetition notes are included as in the EW libraries; they are just employed slightly differently. As with some of the other companies the Imperial has a complete set of pedal up and down and Una Corda samples. These can be switched in and out to conserve on memory. The user interface is pretty straight forward, with adjustable parameter controls like MIDI sensitivity, a dynamic range setting which allows you to compress the overall dynamics, useful for mixing in with other percussive instruments. The amount of pedal noise and sympathetic string resonance can also be adjusted to taste. The piano has a selection of three mic positions, and a superb convolution reverb with impulse responses taken from the Vienna Konzerthaus. Although I have not played all the pianos out there, this looks and sounds like the best instrument around, simply due to its unique form of sampling so many dynamic ranges so meticulously. Although this piano does classical music real justice, other more improvisational forms sound great on it too. In my opinion, the next addition to the high-end sampled piano sets has to be the PMI series from the Swedish firm Sampletekk. Known for their all-encompassing sample libraries, Sampletekk have recently acquired Post Musical Instruments, a Dutch company specializing in high quality keyed instruments such as church and baroque organs, virginals and harpsichords as well as pianos. PMI were really the first to record a high number of dynamic levels, creating a really playable virtual instrument . The 7CG is the flagship Yamaha grand and is recorded at a massive 31 dynamic levels per note. Their other pianos, the Black and White Grands, Bösendorfer 290, The Old Lady and Hybrid are all sampled at between 10 and 20 dynamic levels per note. These are all fine pianos beautifully recorded in great settings with a multitude of mic placements, and short of describing them individually as you would a good wine, it suffices to say they really stand out in terms of playablity. What this collection doesn’t offer in terms of control over acoustic space and timbre, it definitely delivers on playability due to the extensive dynamic range on most of its models. Having worked as a concert piano tuner for several years with Steinway and Sons, I became quite partial to their extremely versatile and transparent instruments, which seem to morph themselves around the individual style of whatever pianist plays them. Quite recently I have had the privilege to work with the less well known Blüthner pianos and I must say, I have fallen in love again! These pianos have a sublime sound, rich in tone, darker and yet more delicate than any of the other giants. The Blüthner Model One was sampled by Dan Dean and Ernest Cholakis at Lukasfilm’s Skywalker sound facility in Hollywood. With just over 4GB disk space, Deane opted to record just one piano at very close proximity thereby minimizing the number of samples. These were recorded in Stereo at 12 velocity layers for sustain pedal up and 12 for pedal down. The reason for the very dry sounding samples is to allow the user to shape the sound with specifically designed impulse responses for timbre, reverb and sustain. The timbre impulses are a unique addition, providing immense control over the tone of the piano. Although you can equally keep the Blüthner dry and use your own reverb, the reverb impulses supplied are very good and bring the instrument to life. The piano supports a mode called ‘variable sustain’, which allows a much more realistic pedaling than just sustain up or down. You do need a sustain/damper pedal that’s capable of sending MIDI messages (controller 64) with continuous controller values to access this function properly though. The dynamic response of the Blüthner Model One offers great flexibility owing to a proprietary technique developed by the makers called ‘Linear db Scaling’. This allows for six different dynamic scaling percentages that are mapped to MIDI velocities. The results are much more natural than can be achieved by trying to shape a velocity curve manually or through your controller keyboard. Granted, this library of samples is of just one piano, and the price pretty much equals some of the larger libraries with three or four pianos in them. But in my opinion none of these alternatives are equivalent in quality or offer anywhere near the level of tonal control that you get with the Digital Model One. 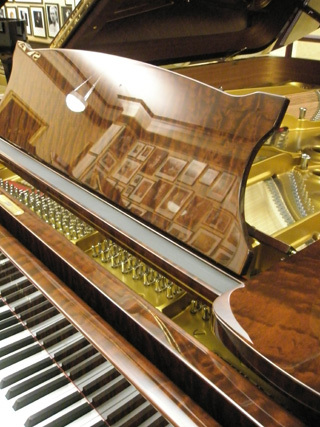 The ‘4th’ generation of pianos, as Modartt like to call their product, is a digitally modelled piano. 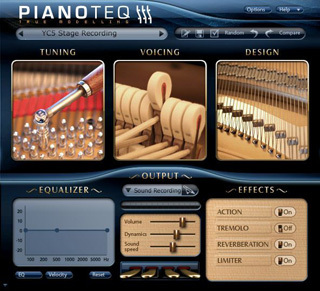 Pianoteq was designed with the idea that the latter approach, the sampled piano, didn’t take into account the great complexity of the instrument. Although the current crop of sampled instruments is of very high calibre indeed, the tonal flexibility of these, including the latter mentioned Blüthner Model One, is limited compared to the freedom you have with a digitally modelled instrument. The maker, Dr. Philippe Guillaume, a piano technician/tuner and a professor of mathematics, managed to combine his two areas of expertise to produce a mathematical model of a piano, like no other so far. 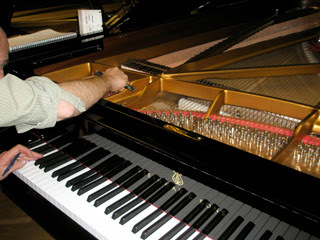 Although the piano doesn’t set out to emulate any make in particular, recordings of a Fazioli grand were analysed, along with other inspirationally sonic references of famous pianists such as Bill Evans and Herbie Hancock. As this model uses no sample data whatsoever to create sound, its footprint is minute compared to its sampled counterparts and is only 15MB in size. Although delivering 256-note polyphony at up to 192kHz, with built-in reverb and EQ processing, Pianoteq’s CPU load is understandably pretty high. The characteristics that can be manipulated in Pianoteq include changes in hammer hardness, amount of sympathetic resonance and piano size. This affords emulation of virtually any kind of piano around. Other unusual features include a variable sustain pedal, an intriguing added ‘staccato sustain’ pedal that provides sustain-pedal resonance without affecting note lengths, and microtonal and variable stretch-tuning. In addition, there is a unison width control, which adjusts the tuning accuracy of the individual strings for higher-register multi-string notes. The sustain pedal emulation has been tackled by different makers to varying degrees of success, but no sampled piano can truly emulate this extremely complex evolving sonic effect. Nevertheless, Pianoteq has done a good job of creating this mathematically. A pedal down brings in a layer of sympathetic overtones, which form a subtle ‘bloom’ around the note. This can be further exaggerated by turning up the Global Resonance control, which governs the amount of resonance of the undamped strings, soundboard and cabinet. A very realistic touch to the sustain is the sound of the dampers lifting off the strings when the pedal is depressed. Comparing pianos is very subjective. Even selecting between different models of the same make, the intrinsic characteristics and feel of a piano suit different temperaments and diverse playing styles and genres. The same applies for virtual pianos. The group I have listed here is by no means all the virtual pianos out there in the market. However, they are a representative sample of the higher end of the scale. They are pianos that can stand their ground well when stripped bare. composers and film makers and have led to a number of successful collaborations. nominated Naama Hillman and fellow composer and BAFTA Juror Rhett Brewer.